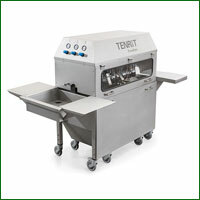 The Tenrit Plus C 16 is a modular asparagus peeling system, which has the ability to peel cucumbers, carrots and other elongated vegetables with a diameter of 8-20mm. or 20-65mm. and a minimum length of 100mm. Depending on the specification of the machine, it can consist of either 2, 3 or 4 modules, therefore equating to a capacity of 7,200-14,400 asparagus stalks per hour. The vegetables are placed on the singulation conveyor and transported onto the feed belt trays. They are then fed onto the V-belts of the individual modules and deposited there. They are then transported to the peeling load and fed gently through the machine by 20 pendulous transport roller pairs and peeled at 8 peeling stations each consisting of 2 blades. 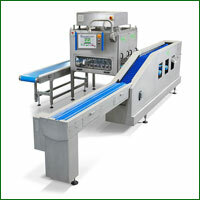 The peeling stations are positioned so that the vegetables are thoroughly peeled during their transport through the machine. The peeled vegetables are passed to a discharge conveyor, where the staff can immediately process them. 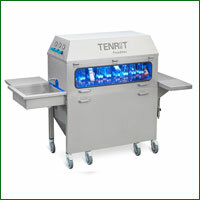 Each module can be taken out of the machine for cleaning and maintenance purposes. The blades and transport rollers are fitted with a quick release system making it possible to easily change blades during cleaning, for an example. 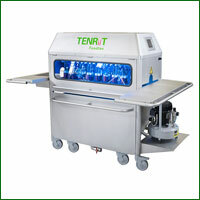 The Tenrit Pluc C can be operated via the large LCD touchscreen with an international user interface. 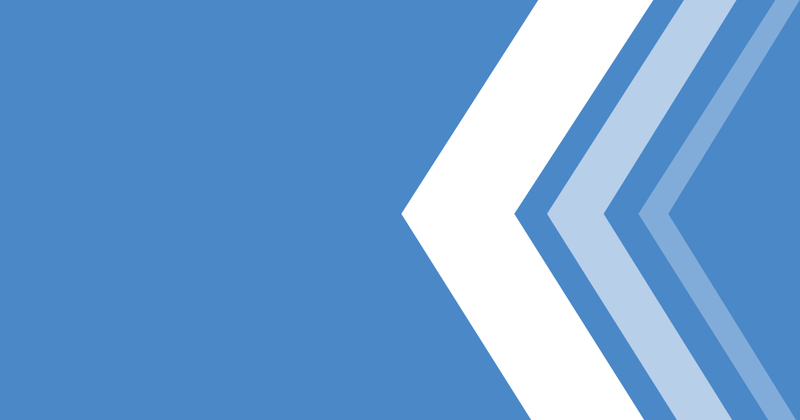 This enables individual control and adjustment of the machine.